5th Avenue North is an east-west downtown street in Birmingham's northside. It ends at a drainage headwall for Valley Creek at 7th Street North to the west and becomes Messer Airport Highway to the east as it crosses below the Elton B. Stephens Expressway and the Norfolk Southern Railroad. The eastern end of 5th Avenue North downtown was once the principal entranceway into Birmingham by rail, as it was the site of the Birmingham Terminal Station. Many of Birmingham's early hotels were constructed along 5th Avenue heading west toward 20th street from the station. The intersection of 5th Avenue North with 24th Street North is close to the geographical center of Birmingham. A large storm culvert extends from downtown to I-65 below 5th Avenue North. There is a short, block-long strip of 5th Avenue North adjacent to Forest Hill Cemetery in Woodlawn and another dead-end section between Trotwood Park and I-59. A longer section of 5th Avenue North is located in East Lake between 73rd and 90th Streets. An unconnected short dead-end section can also be accessed by 91st Street North near Zion Memorial Gardens. In 1945 electric lighting was installed on 5th Avenue North between Center Street and 19th street under the city's contract with the Birmingham Electric Company. In October 1958 5th Avenue North was converted into a four-lane thoroughfare by eliminating on-street parking from Bush Boulevard in the west to 41st Street in Avondale. The move was expected to increase the street's traffic-carrying capacity by 30 percent and was part of a traffic plan by which 1st and 5th Avenues would serve as cross-town thoroughfares while 2nd, 3rd and 4th would serve for bus traffic and as connectors to the downtown business district. The installation of new coordinated traffic signals and the removal of obsolete streetcar wires was part of the conversion. 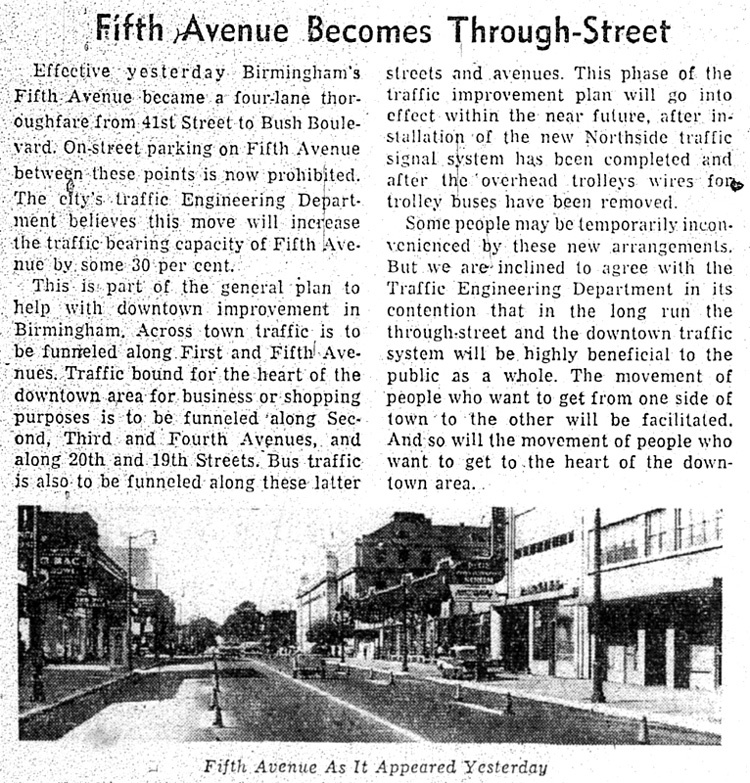 5th Avenue North was converted from two-way to one-way (eastbound) traffic was from 9th Street North to Red Mountain Expressway in 1973 by the Alabama Department of Transportation's TOPICS (Traffic Operations Program to Increase Capacity and Safety) program. This page was last modified on 25 March 2019, at 09:39. This page has been accessed 26,000 times.